Take the stress out of giving a gift. Allow us to Partner with you to help you create a special gift with meaning. Choosing the right gift can be time-consuming and stressful. By partnering with you, we help you design your own gift so you’re part of the creative process. We take the stress out of gift-giving. We help you clarify your vision and help you uniquely express your love and intention to give a gift that has special meaning. Customize your jewelry and your healing treatment by choosing which gemstone energies will be applied to your personal energy field…or the energy of someone in your life. Gemstones are natural healing tools. Besides being beautiful, they emit subtle energy that helps us heal on mental, emotional, spiritual and physical levels. 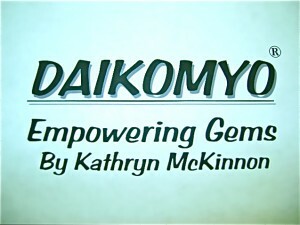 We go one step further at DAIKOMYO® Empowering Gems and infuse our jewelry with a variety of healing energies. When you wear a piece of healing jewelry, or keep a piece on your person, the healing properties of that particular gemstone act gently and subtly upon you, affecting your energy field and effecting positive change. People sensitive to subtle energy fields can actually feel the change in energy provided by each particular gemstone. • is trying to conceive a child? • has bouts of depression? Basically, anyone challenged by a state of dis-ease can benefit from the healing energies of gemstones. we will design a piece just for you! Love a specific design, but wish it was in a different color or gemstone? No problem! We can do that for you! Do you know someone who has special needs that could be helped by our Energy-infused jewelry? We can help you make a choice to give as a gift. Have a special condition you’d like to treat with gemstones? We can help you find exactly the right combination of gems to bring the proper energies into play to help you heal on subtle levels. That’s because of the special nature of this Energy-infused, gemstone jewelry. As you wear your DAIKOMYO® jewelry, your energy is affected by the energy of the Healing Energy, as well as by the energy of the gemstone incorporated in it. Over time, healing energy acts upon your energy body and when a significant energy shift takes place, your jewelry can break! Ancient Wisdom says that under these circumstances it is good luck, for this energy shift means you have released some stress, some emotion or have let go of something you’ve been holding onto that no longer serves you. It may also mean you’ve paid off a “karmic debt.” If this happens, it’s a good idea to throw the jewelry tag or a small piece of the broken jewelry into a moving body of water. It is believed that this symbolic action will release the emotion or debt and end the karmic cycle. If this should happen for you, contact us again and we will repair your jewelry in a manner that honors the energy of the gems that brought you healing. Your continued enjoyment of the piece will also honor the gemstones, the Healing Energy and the change that they brought into your life. Care and Cleaning: Even though gemstones are durable enough to wear every day, they can crack or break if they come into contact with any hard surface. Always “roll” a stretch bracelet over the wrist. Keep this jewelry away from harsh chemicals, hairspray, lotion and perfume. Clean the jewelry with a soft, white cotton cloth moistened with cool water. Dry with a white cotton cloth. Periodically, place your DAIKOMYO® Empowering Gems in full moonlight for a few hours or place in a dish with dry sea salt to revitalize the energy within the gems and to eliminate any negative energy that has been transferred to the gems over time. REIKI means Universal Life Force–the healing, loving, creative energy that interpenetrates all of creation. This ancient, 2,500 year-old healing technique balances and energizes all systems in the body. REIKI Healing Sessions: REIKI is a complete system of healing. It heals on four levels–physically, spiritually, mentally and emotionally. It reduces pain and stress and heals the root, or cause of the pain or condition. During a REIKI Session, The REIKI energy is drawn through the practitioner’s hands to your body. As this Life Force flows through you, it reenergizes and heals you. You don’t use any of your own energy. This energy comes directly from Source or whatever you know to be your God or Universal Life Force. REIKI is always gentle and can only be used for a person’s highest healing good. It is simple and natural. No faith or belief is required to receive REIKI; it bridges all faiths, religions and cultures. It is heart-centered, meditation in action. REIKI is often used in conjunction with other modern healing modalities and enhances their effectiveness. Distance Healing is available for 30-60 minute sessions. REIKI Attunement: A REIKI Attunement connects you with the Universal Life Force Energy and activates your ability to heal yourself and facilitate healing in others. Receiving an Attunement by a REIKI Master enables you to be a vehicle for this Universal Life Force. REIKI Attunements balance and align the energy centers or “chakras” in the body, enabling you to channel the Universal Life Force Energy through your own hands to wherever it is needed. An Attunement sensitizes your hands and provides you with a lifetime of protection. It can be used anywhere, anytime, by anyone. REIKI I can be used to heal stress, anxiety, aches and any physical, spiritual, mental, or emotional pain. It can be used anywhere on the body and can be used to heal plants, food, water and pets as well. After you receive the REIKI I Attunement, you perform the healing for yourself or others with hands on you or the other person or living thing. The Attunement is done once and it lasts a lifetime. REIKI II Attunement: With a REIKI II Attunement, healing can be sent without physical contact. This is known as distance healing. This type of healing can be used to work with deep mental and emotional issues, to heal individuals, situations and relationships. REIKI II intensifies REIKI I. REIKI II also intensifies a person’s intuition, memory, creativity and connection to the Life Force. It can be used to help you discover your purpos or calling, to enhance relationships, to increase sales and business performance, to attract money, to find lost items and to even heal situations in the past or future. REIKI II can be performed 3 months after the REIKI I Attunement takes place. REIKI is a powerful tool for optimal health, personal growth and transformation. It also supports individuals on their spiritual path. For more information about receiving REIKI Healing or Attunements in person or at a distance, please contact us. Email us at info@DAIKOMYO.com for orders and special requests or call us at 781-631-2193 if you have a question about what we offer, if you would like to order a healing session or Attunement or if you would like to create a customized piece of jewelry to address a specific issue.